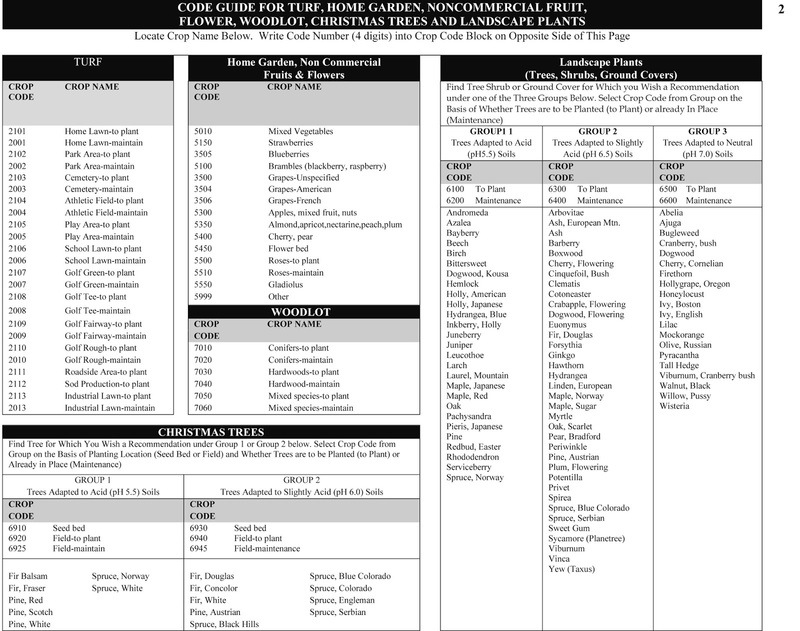 Penn State Extension Philadelphia Master Gardeners : Questions from the Master Gardener Hort Line: Soil Testing, How Do You Get One and What Does It Mean? Questions from the Master Gardener Hort Line: Soil Testing, How Do You Get One and What Does It Mean? Volunteers for the Philadelphia Master Gardener Hort Line have researched and answered some interesting questions. From time to time, we'd like to share some of those questions with you. 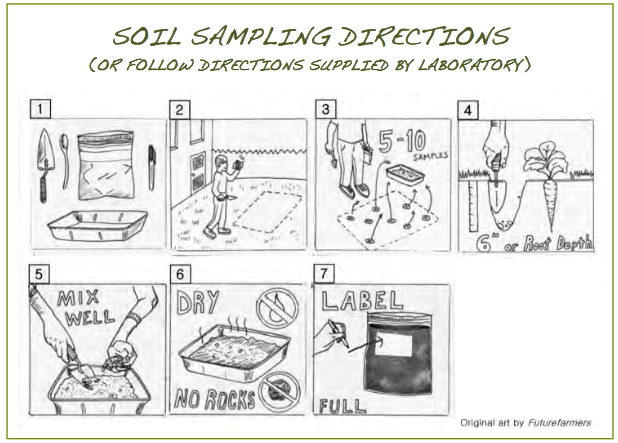 There are more questions about soil testing than any other topic on the Hort Line. We get questions about how to have testing done as well as how to interpret the results. 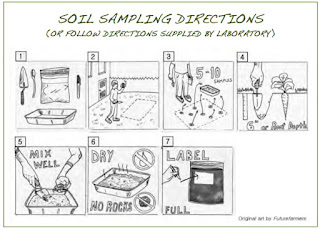 Getting a soil test is simple. Stop by any Penn State Extension office to pick up a kit. The address for the Philadelphia office is 675 Sansom Street, Philadelphia, PA and the phone number is (215) 471-2200. Call ahead to make sure someone will be there. The cost for a basic soil fertility test is $10. 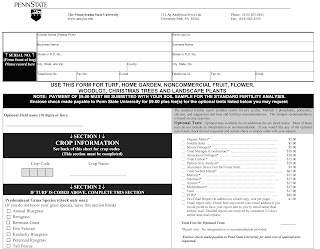 The kit consists of a sample bag, envelope, and form to be completed for your garden. 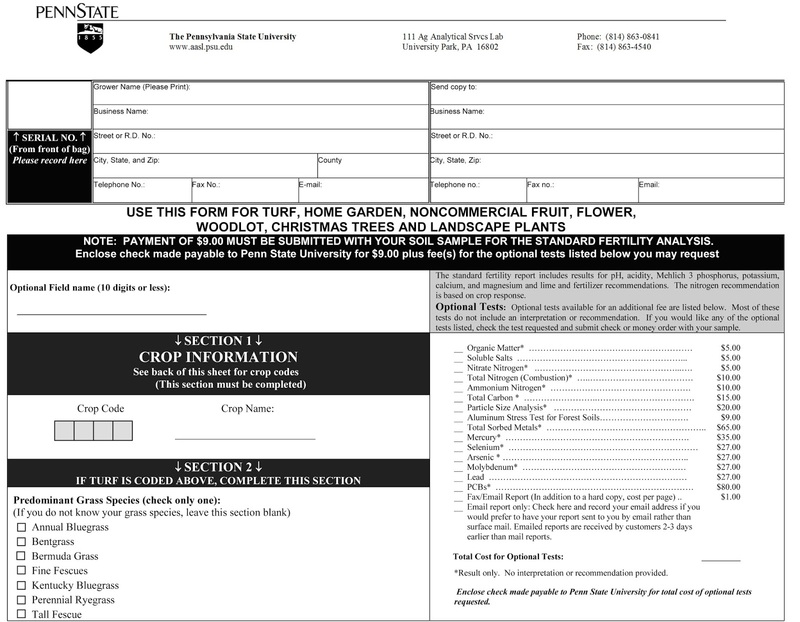 Include a check payable to “The Pennsylvania State University” along with your sample and completed form. Complete the entire form as instructed. Different plants have different nutritional requirements. 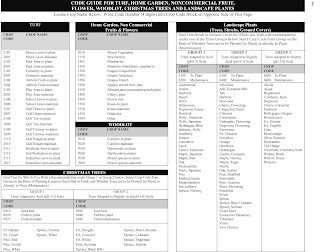 Read the list on the second page of the form and choose the one that most closely describes your garden. Include the serial number from the bag if using a kit from the office. You can leave that space blank if you are using your own bag. Any clean garden trowel will work to collect samples. Collect soil from the top 6 to 12 inches from 5 to 10 different spots in the garden to get a good representative sample. Remove plant debris and stones. Dry the soil on clean newspaper and then place it in your sample bag. Be sure to label the bag with your name! And mail it to the address on the form. If you have multiple beds, each with a different use, you may want to submit more than one sample, with a completed form and fee for each one. Your report will arrive in about 2 weeks. There will be a text box labeled “Soil Nutrient Levels” that will list pH as well as phosphorous, potassium, magnesium, and calcium levels. Look at the bar graph to see whether those levels are below optimum, optimum or above optimum. The lab will adjust this for your stated garden use. The actual values are listed in a box at the bottom of the page. If any item is not within the optimum range, there will be suggestions in the text box below. To address nutrient levels, there will be a recommendation for fertilizer. Fertilizers available in garden centers will have an N-P-K value consisting of 3 numbers. The first number is the total percentage of nitrogen (chemical symbol N), the second for phosphate (chemical formula P205), and the third for potassium (chemical formula K2O), usually in the form of potash. For example, a fertilizer with an N-P-K value of 5-10-50 would consist of 5% nitrogen, 10% phosphate and 50% potassium. Fertilizers come in a variety of compositions of these chemicals. Typical combinations include: 5-10-50, 5-10-10, 10-10-10, 8-0-24, and 6-6-18. You can see that these fertilizers would give very different results in the garden. 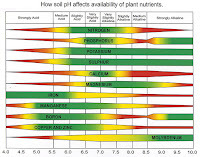 Your soil test will help you decide which of these would be best for your garden. Keep in mind, though, that chemical fertilizers must be applied correctly. Too little will have minimal effect, and too much can harm rather than help. Follow directions on the package carefully. Also, chemical fertilizers don’t have a long-term effect on the soil. The addition of compost and/or composted manure can make more permanent improvements. You can add bone meal to increase phosphates and kelp to increase potassium. These are available at garden centers. Compost will take longer to improve your soil than chemical fertilizers, so you may want to add fertilizer for a year or two while the compost does it’s magic. 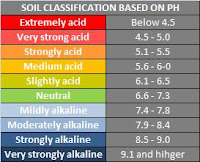 Another important part of your soil test is the pH analysis. The lists on the back of the submission form shows that plants vary widely in their optimum pH level. 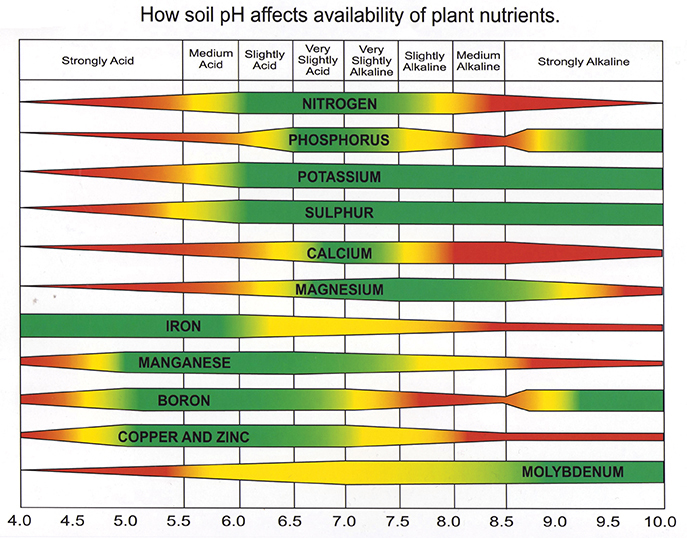 pH also affects how well your plants take up nutrients. pH is a measure from 1 to 14 that indicates acidity or alkalinity. Low pH is acidic and high pH is alkaline or basic. Neutral pH is 7.0, where a substance is neither acid nor basic. pH units change by an order of 10, so a pH measurement of 6.0 is 10 times more acidic than a pH of 7.0. Generally, vegetable gardens should be about pH 6.5, or a little lower than neutral. But some plants, such as blueberries like to grow in acidic soil, while clematis, for example, thrives in slightly alkaline soil. You will need to do a little research on your plants to be sure you are working toward the correct pH. As with nutrients, there are actions you can take to change pH. Your soil report will recommend an amount of lime to increase the pH of your garden. The addition of sulfur will decrease pH but this has the same short-term effect as chemical fertilizers. Compost and other organic matter will decrease the pH of soil more gradually, but will be a more long-term fix. If you have any other questions and are not sure where to turn, ask the Hort Line! If we don't know the answer, we know someone who does! Lead Contamination: Is my Garden Soil Safe?